This is one of my favorite vegetable dishes of the Italian kitchen. Late-summer bell peppers — red, yellow, or orange — and an equal amount of yellow onion are stewed together in olive oil until they become limp in their own syrupy juices. A rich sherry or balsamic vinegar is stirred in to finish; the vinegar accents the peppers and onions, adding just a touch of sour to the sweet. It’s no problem to turn this into a sauce for a pound of dried egg pasta. Melt a little butter into the sauce to extend it, then garnish the dish with grated Parmesan and freshly ground black pepper. Or mix the peperonata with fried, crumbled Italian pork sausage and serve tossed with rigatoni. Peperonata is endlessly versatile. It’s a side, a companion to polenta, or an antipasto on bruschetta with soft goat cheese, black olives, and basil. 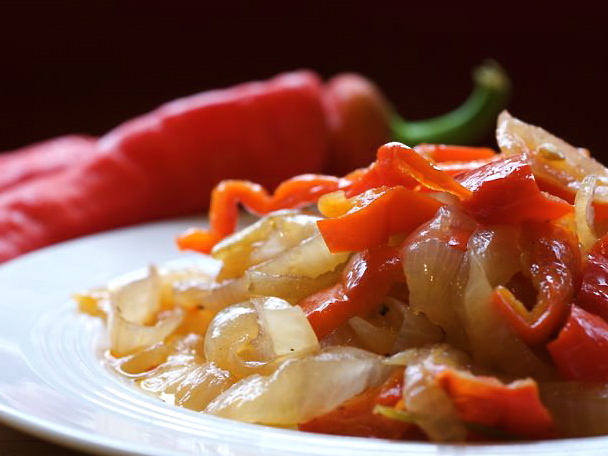 Put the olive oil, peppers, and onions in a large skillet and turn the heat to medium-high. Sauté, stirring, until the vegetables begin to soften. Turn the heat down so the mixture simmers, cover partly with a lid, and cook, stirring occasionally, for about 15 to 20 minutes. Season mixture with salt and continue cooking at a steady simmer for another 15 to 20 minutes, or until peppers and onions are thoroughly tender. Stir in the balsamic vinegar to taste and adjust seasonings. Serve hot or at room temperature. Read more about vinegar in Kelly Myers' "Vinegar basics."